Just because you're not at the games doesn't mean you can't kick off the tournament in a biggie way. 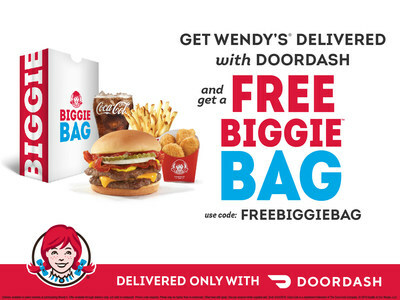 Starting today, Wendy's® is teaming up with DoorDash* to exclusively offer fans a free $5 Biggie™ Bag**. All you have to do is add the Biggie Bag to your cart and use promo code FREEBIGGIEBAG to score this sweet deal – available for a limited time, only with DoorDash! And did we mention that you can get your Wendy's meal delivered to you through DoorDash for a $0 delivery fee, too?! No promo code required, you just need $10 minimum+ in your cart for $0 delivery to kick-in. Other fees (including service fee), taxes, and gratuity still apply. Wendy's new $5 Biggie Bag++ is this season's MVP, including the new Bacon Double Stack™, 4-piece chicken nuggets, small fries and a small drink – yours free when you order through DoorDash. ** While the $5 Biggie Bag will be sticking around, the Bacon Double Stack will only be in restaurant for a limited time. BUT WHAT'S THE NEW BACON DOUBLE STACK? The new Bacon Double Stack features two patties of fresh, never frozen beef+++, topped with Applewood Smoked bacon, melty American cheese, crunchy crinkle-cut dill pickles, fresh white onions, ketchup and mustard. Fans can dunk on this delicious deal through Sunday, March 24, or while supplies last. Whether it's a give and go or a pick and roll, head to DoorDash.com or the app on iOS or Android to order Wendy's before these deals are eliminated. Order delivery through DoorDash and use the code FREEBIGGIEBAG at checkout to receive one free $5 Biggie Bag. You can also score $0 delivery with any $10 purchase through March 24, no promo code required. The promo code can only be used one time for each DoorDash account. * Delivery available in select markets at participating restaurants. **Free Item: Offer valid for one (1) Biggie Bag while supplies last or through March 24, 2019. Not valid for pickup or dine-in. Limit one per person. Fees, taxes, and gratuity apply. All deliveries subject to availability. Must have or create a valid DoorDash account with a valid form of accepted payment on file. No cash value. Non-transferable. Use promo code FREEBIGGIEBAG to redeem. See full terms and conditions at dasherhelp.doordash.com/offer-terms-conditions. +$0 Delivery Fee: Offer valid through March 24, 2019. Valid only on orders with a minimum subtotal greater than $10. Limit one per person. Other fees (including service fee), taxes, and gratuity still apply. All deliveries subject to availability. Must have or create a valid DoorDash account with a valid form of accepted payment on file. No cash value. Non-transferable. No promo code necessary to redeem. See full terms and conditions at dasherhelp.doordash.com/offer-terms-conditions. ++At participating restaurants. Price and participation may vary in Alaska and Hawaii. +++Fresh beef available in the contiguous U.S., Alaska, and Canada. Price and participation may vary. Wendy's was founded in 1969 by Dave Thomas in Columbus, Ohio. Dave built his business on the premise, "Quality is our Recipe®," which remains the guidepost of the Wendy's system. Wendy's is best known for its made-to-order square hamburgers, using fresh, never frozen beef*, freshly-prepared salads with hand-chopped lettuce, and other signature items like chili, baked potatoes and the Frosty® dessert. The Wendy's Company (NASDAQ: WEN) is committed to doing the right thing and making a positive difference in the lives of others. This is most visible through the Company's support of the Dave Thomas Foundation for Adoption® and its signature Wendy's Wonderful Kids® program, which seeks to find every child in the North American foster care system a loving, forever home. Today, Wendy's and its franchisees employ hundreds of thousands of people across more than 6,700 restaurants worldwide with a vision of becoming the world's most thriving and beloved restaurant brand. For details on franchising, connect with us at www.wendys.com/franchising. Visit www.wendys.com and www.squaredealblog.com for more information and connect with us on Twitter and Instagram using @wendys, and on Facebook at www.facebook.com/wendys.